If it is warm enough, go on a walk and point out more things that God created. You can even play a simple version of I spy- "I see something green" and basically anything they say that is actually green counts. Bring a stick for everyone and yarn to transform the booklet into a mobile instead. It will work best if you cut apart the pictures and punch the holes ahead of time. Play this fun Creation Matching Game from Green Jell-O with Carrot with the older set. For the younger ones, you can put the pictures in a bag and pick them out and hang on the board as you talk about them. Use these Creation Cut-Outs from Latter-day Chatter to do a flannel board presentation, puppet show, or hide pieces around the room for the children to collect. 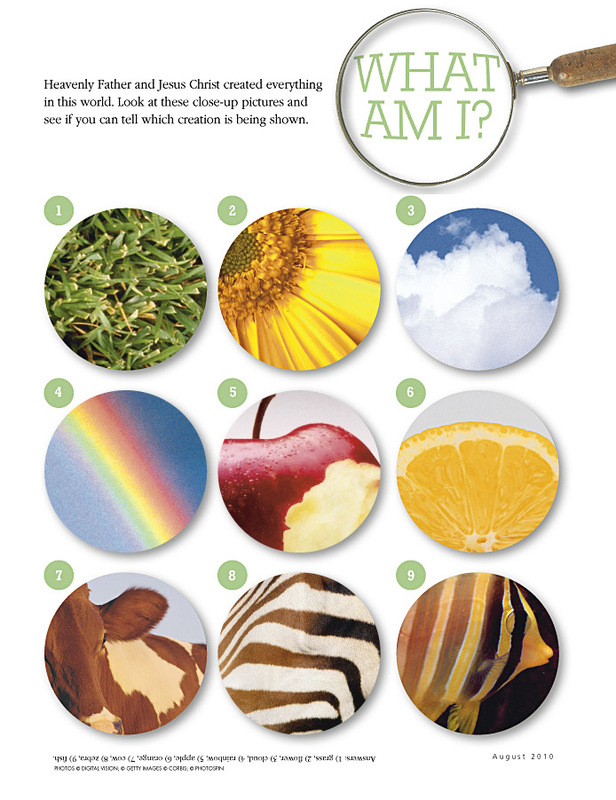 Jesus Christ Created the earth collage- The first page has the words and a circle for the earth. Print the next pages on green and yellow paper to save coloring time. Cut the pieces out and glue on top. When I was in Nursery, I'd walk around with a bottle of glue and put dots where they needed to put something and left the rest up to them. Turn it into a textile activity- Have a lot more fun with this activity by bringing in some great texture pieces. Cut pieces of sandpaper or felt for the land and use foam glitter stars stickers for the universe. Try some animal print pom poms for the animals (I got mine at Hobby Lobby). Use the first page of handout still for the base and if you are daring- try washable watercolor for the water or use blue bubble wrap pieces for the water. It will probably look crazy in the end but so much fun! If you like these lesson helps, please pin it or share the url with your friends so more people can find it. Thanks! The Creation- Some pictures of the creation that you could us during the lesson. Try putting them together as a necklace or giving out to each to child to hold when you tell your lesson. Reverence for the Creation- This one has some pictures to glue onto a box lid to create a scene. Animal Match-up- Cut the pictures in half. Glue half on a paper beforehand and have the children do the rest at nursery. Or play memory matching up the two sides of the animals. The kids could also make silly animals by mixing up the halves instead. Gratitude for God's Creations- A pioneer perspective on being grateful for God's creations- includes a picture of pioneer wagon that can be used as a view finder. I Live in a Beautiful World- Can color these pictures or use them to talk about different ways we can appreciate God's creations- through all our senses. 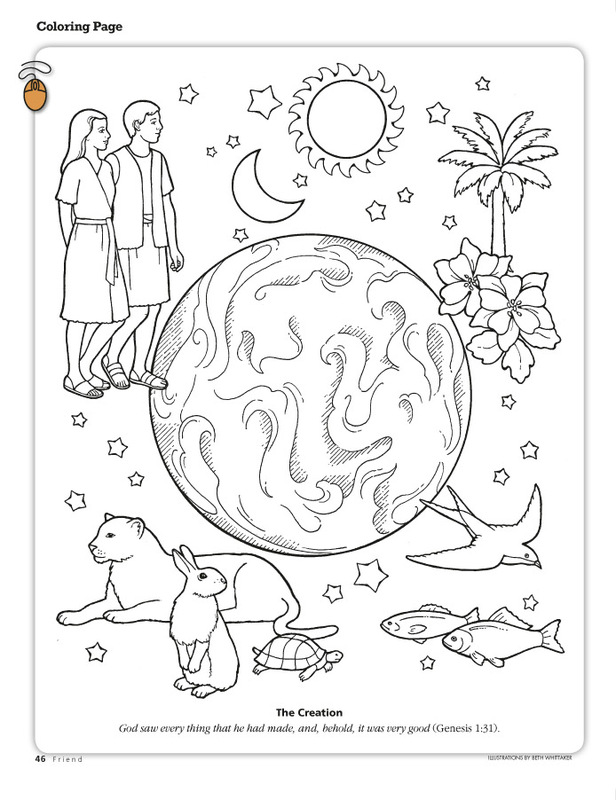 World Frame- Draw a picture of yourself in the middle enjoying God's creations.